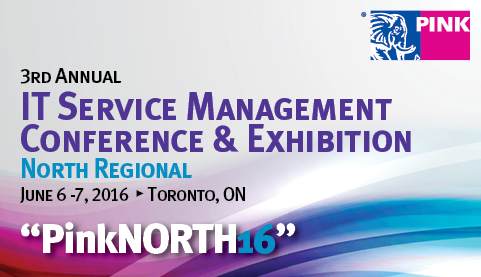 This past week I had the opportunity to speak at a PINKNorth16 in Toronto. While I have attended a few Pink events in the past, this was my first time presenting there. The event itself is what you would come to expect from Pink Elephant; well organized, fast paced and full of diverse content for connoisseurs of all things service management. While my presentation was on “7 Top Tips to Start and Sustain Problem Management” there was a wide variety of topics including IT Asset Management, Business Relationship Management and Organizational Change Management to name a few. Aside from absorbing all the content you could possible handle in 2 days there was an excellent opportunity to network with like-minded professions from all levels. In my opinion, networking coupled with content enables you to get a balance of information at an event of this nature. The key to get yourself at one of these events is to make a case to whoever pulls the purse strings at your organization. You will need to frame it in a way that will outline the return on investment for attending the conference. Take a look at the sessions and tracks and apply them to your current organizational hurdles. For the most part the session will only be the beginning of the discussion as many presenters like me are available to discuss and answer questions that might apply to your organization. If given the opportunity to speak at a Pink event again I would jump at the chance.